Pickled herring fillets are traditional Norwegian summer food. The dish should be served chilled with boiled potatoes, raw onion rings, beets, fresh chives, flatbread and sour cream. 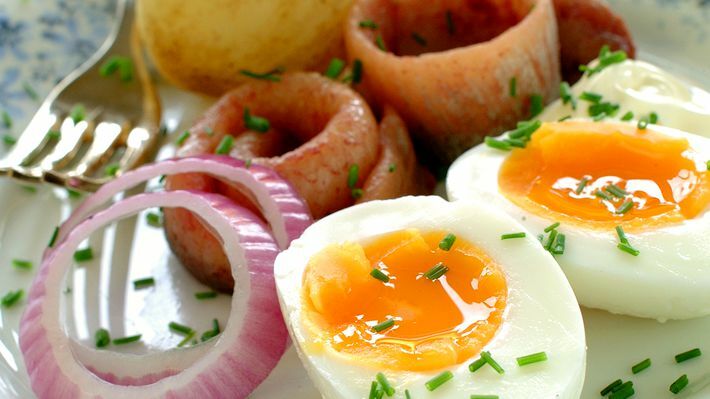 In this recipe the herring is served with what we in Norway call “smiling eggs” (in between soft-boiled and hard-boiled eggs, cut in half)! 1. Boil the potatoes gently until tender. 2. Boil the eggs for 6-8 minutes and cool in cold water. Peel the eggs and cut them in half. 3. Roll up the herring fillets. Clean the onion and cut it into rings. Serve on a plate and sprinkle with chopped chives. Serve with flatbread and sour cream.